If you’re keen to remove the hassle of cooking for Thanksgiving this year, but don’t feel like venturing out to a restaurant, here’s a list of eateries and companies offering pre-made Turkey Day packages with all the trimmings, that can be savoured in the comfort of your own home. Lazy Gourmet provides an easy and affordable Thanksgiving turkey dinner. For a minimum of six people, Lazy Gourmet offers a turkey with all the fixings, an impressive feast if you’re hosting a Thanksgiving dinner party. The platter comes with appies (mixed greens with pumpkin seeds, cranberries and black current vinaigrette), supplemental sides (mashed potato, cherry tomato and basil stuffing, roasted Brussel sprouts, and cranberry apple relish), a herb roasted turkey, and dessert (a selection of Lazy Gourmet Holiday baking). 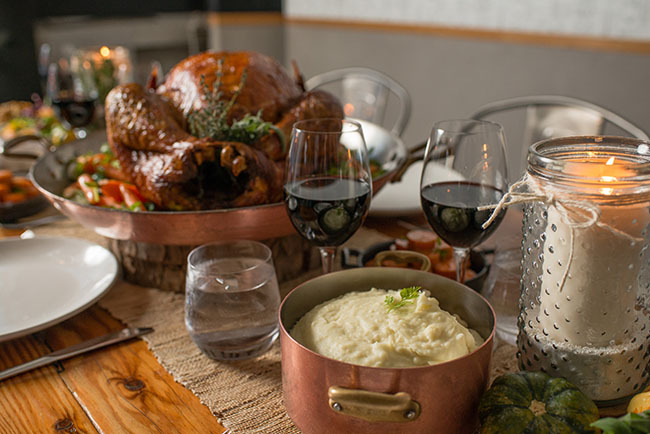 Truffles Fine Foods is offering a Thanksgiving take-out package for $100. A family of four can feast on Truffles’ fully loaded Thanksgiving dinner featuring roast turkey, stuffing, mashed potatoes, roasted root vegetables and a pumpkin pie. To order: Call 604-505-4961 or pop into one of the Truffles Kitchen locations. Orders must be placed on the Friday before Thanksgiving (October 9). For the traditionalists, Railtown Catering is offering a “Thanksgiving To-Go” gourmet dinner package on October 11 and 12 that is available for pick-up and delivery (hot or cold). The to-go package includes a 16-pound sage-roasted organic turkey along with an array of gourmet seasonal side dishes (organic mesclun greens, maple-glazed sweet potatoes, and buttered baby carrots), and is ideal for 8-10 dinner guests. 10 per cent of the proceeds from the sale of each Thanksgiving To-Go package will be used to serve meals to Railtown Catering’s neighbour, Mission Possible, a non-profit organization that provides street-level care for those with immediate and critical needs in the Downtown Eastside. To order: Call 604-568-8811. Orders must be received by midday Thursday, October 8. Boy With A Knife Catering takes away all the cooking stresses that come with Thanksgiving. This year the catering company is offering a hearty Thanksgiving spread, fully prepared and dropped off to your doorstep or picked up at their Richmond location in re-heatable containers. The feast will include organic greens with roasted butternut squash, toasted pumpkin seeds, crispy fried shallots and a maple mustard vinaigrette, butter roasted herb turkey with stone fruit and leek stuffing, roasted autumnal vegetables, roasted garlic and rosemary mashed potatoes, and an upside down plum and blueberry cake. To order: Call 604-278-0543. Minimum three day notice. Oyama Sausage may not offer an entire Thanksgiving spread but they certainly provide some of the city’s best prepared meats. Come the harvest holiday enjoy a juicy Swedish Ham from the Granville Island store. In addition to their sought-after ham Oyama Sausage also offers a tantalizing selection of patés, terrines, sausages, salamis, prosciuttos, cheeses and more. To order: Call 604-327-7407. It’s imperative that you preorder a half or whole ham, Oyama only prepares a certain amount and once they’re gone, they’re gone! If you’re simply after one or two Thanksgiving meals, be sure to contact the L’Epicerie Rotisserie & Gourmet Shop on Granville Island. For $14.99 a person you can pre-order a turkey dinner consisting of a boneless turkey leg, truffled mashed potatoes, and an assortment of roasted vege. Escape the kitchen this Thanksgiving with a delicious dinner, prepared by Black + Blue’s chefs. Featuring a mixed green salad, a whole roasted turkey, pecan and sage stuffing, Brussels sprouts and bacon, mashed potatoes, green beans, cranberry relish, and an apple pie, Black + Blue feast is sure to satisfy everyone’s Turkey Day cravings. To order: Call 604-637-0777 by October 7. Pick up October 11 or 12.